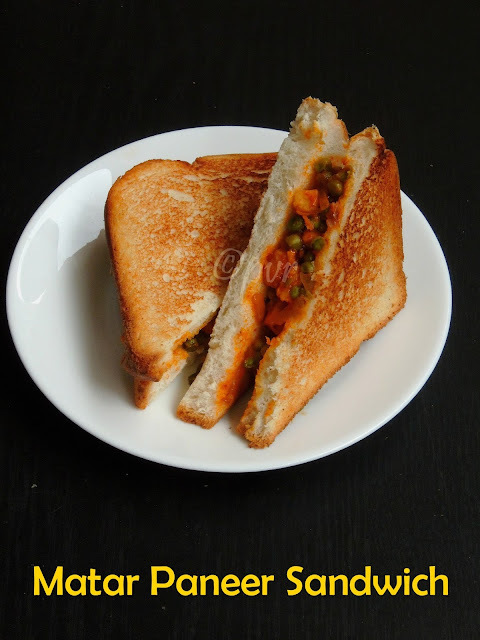 Matar Paneer sandwich makes a healthy and super filling breakfast or lunch for kids. Pack this sandwich in their lunch box, am sure their lunch box will be definitely empty. This matar paneer or mutter paneer is quite an easy dish to make if you have all the ingredients at home. This simple version of matar paneer makes an excellent stuffing for making sandwiches. Trust me, this sandwich is everyone's favourite at home and they vanished very much quickly once i served them. Sandwiches makes a satisfying meal if they are served with a simple salad along with a dessert. Paneer and green peas masala stuffed inside the toasted bread slices, trust me while typing itself my mouth is watering.Sending to Kalyani's Monsoon Mojo Event..
Am running this week's of blogging marathon with easy school recipes, with simple ingredients you can dish out this alluring sandwich within few minutes. I used frozen green peas for making this sandwich, if you want to go with dried &soaked peas or fresh peas just make this sandwich with them. However the addition of paneer turns out this sandwich more interesting, obviously this sandwich is definitely a real feast to whoever love paneer in their food. 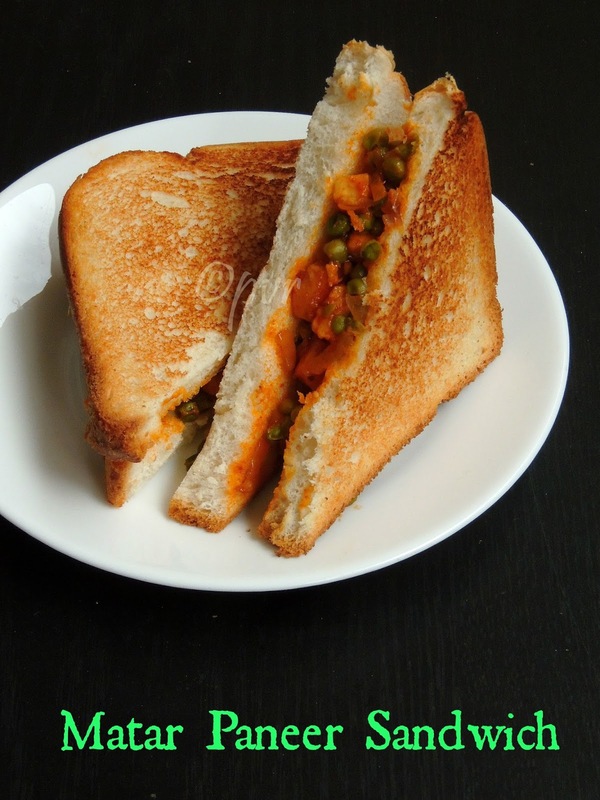 Want to give a try to a different sandwich, then you dont have any excuse to give a try to this alluring paneer,peas sandwich. Heat enough oil and fry the paneer cubes until they turns golden brown, keep aside. Add again enough oil to the same pan, let crack the cumin seeds, add immediately the chopped onions, saute until the onions turns transculent, add now the chopped tomato pieces and cook until they turns mushy. Now add the green peas with red chilly powder, coriander powder, garam masala powder and enough salt, saute everything in simmer. Finally add the fried paneer cubes and coriander leaves, toss gently until the masala gets well mixed, cook everything in simmer for 5minutes and put off the stove. Heat few drops of oil, drop a bread slice, top it with enough matar paneer, close it with an another bread slice. Cook in simmer until the bread turns brown, flip and cook the other side. great sandwich with indian flavors..looks lovely.. Excellent and delicious looking sandwich. Very colourful preparation. 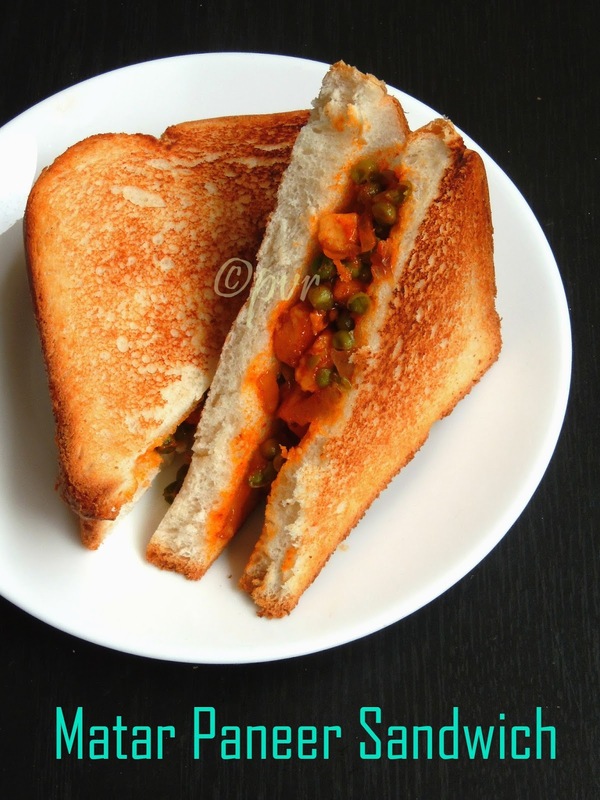 Sandwich looks delicious, lovely combo of matar paneer. Love to eat them anytime. What a colorful and delicious looking sandwich. A filling sandwich for breakfast.